SIMPONI® induction dosage regimen is two, 100-mg SC injections at Week 0, followed by 100 mg at Week 2, and then maintenance therapy with 100 mg every 4 weeks. Humira® induction dosage regimen is four, 40-mg SC injections at Day 1 (given in one day or split over two consecutive days), followed by two, 40-mg SC injections at Day 15, and then maintenance therapy with 40 mg every other week starting at Day 29. This is not intended to compare the safety, effectiveness, or uses of these treatments. Please refer to each product’s Prescribing Information for recommended dosing and administration. Humira® is a registered trademark of AbbVie Inc. 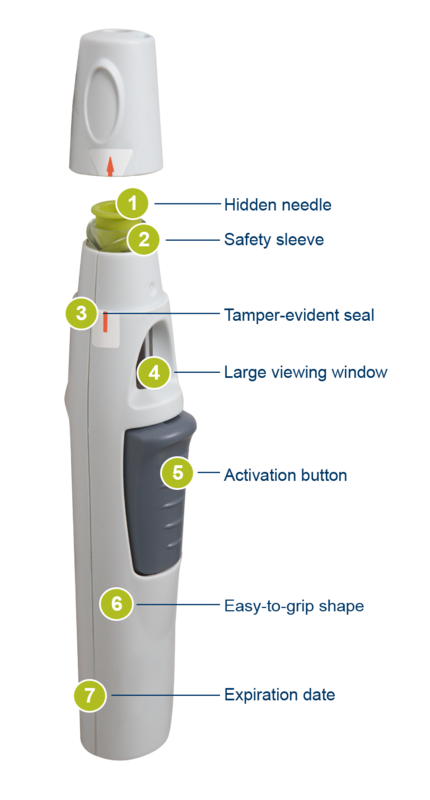 Patients will hear a first click when the dose begins to dispense and a second click when the injection is complete and the needle has retracted. SIMPONI® is intended for use under the guidance and supervision of a physician. Patients may self-inject SIMPONI® after physician approval and proper training. References: 1. SIMPONI® (golimumab) Prescribing Information. Janssen Biotech, Inc. 2. HUMIRA® (adalimumab) Prescribing Information. AbbVie Inc. 3. Sandborn WJ, Feagan BG, Marano C, et al; PURSUIT-SC Study Group. Subcutaneous golimumab induces clinical response and remission in patients with moderate-to-severe ulcerative colitis. Gastroenterology. 2014;146:85-95. Patients treated with SIMPONI® (golimumab) are at increased risk for developing serious infections that may lead to hospitalization or death. Most patients who developed these infections were taking concomitant immunosuppressants such as methotrexate or corticosteroids. Discontinue SIMPONI® if a patient develops a serious infection. Active tuberculosis (TB), including reactivation of latent TB. Patients frequently presented with disseminated or extrapulmonary disease. Patients should be tested for latent TB before SIMPONI® use and during therapy. Treatment for latent infection should be initiated prior to SIMPONI® use. The risks and benefits of treatment with SIMPONI® should be carefully considered prior to initiating therapy in patients with chronic or recurrent infection. Do not start SIMPONI® in patients with clinically important active infections, including localized infections. Closely monitor patients for the development of signs and symptoms of infection during and after treatment with SIMPONI®, including the possible development of TB in patients who tested negative for latent TB infection prior to initiating therapy, who are on treatment for latent TB, or who were previously treated for TB infection. Risk of infection may be higher in patients greater than 65 years of age, patients with co-morbid conditions and/or patients taking concomitant immunosuppressant therapy. Other serious infections observed in patients treated with SIMPONI® included sepsis, pneumonia, cellulitis, abscess and hepatitis B infection. Lymphoma and other malignancies, some fatal, have been reported in children and adolescent patients treated with TNF blockers of which SIMPONI® is a member. Approximately half the cases were lymphomas, including Hodgkin’s and non-Hodgkin’s lymphoma. The other cases represented a variety of malignancies, including rare malignancies usually associated with immunosuppression and malignancies not usually observed in children or adolescents. Malignancies occurred after a median of 30 months after the first dose of therapy. Most of the patients were receiving concomitant immunosuppressants. In the controlled portions of clinical trials of all TNF-blocking agents including SIMPONI®, more cases of lymphoma have been observed among patients receiving TNF-blocking treatment compared with control patients. In the Rheumatoid Arthritis (RA), Psoriatic Arthritis (PsA), and Ankylosing Spondylitis (AS) clinical trials, the incidence of lymphoma per 100 patient-years of follow-up was 0.21 (95% CI: 0.03, 0.77) in the combined SIMPONI® group compared with an incidence of 0 (95% CI: 0, 0.96) in the placebo group. 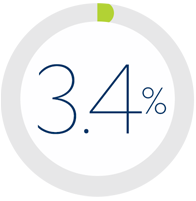 In clinical trials, the incidence of malignancies other than lymphoma was not increased with exposure to SIMPONI® and was similar to what would be expected in the general population. In controlled and uncontrolled portions of the Phase 2/3 studies in ulcerative colitis (UC) with a mean follow-up of approximately 1 year, there were no cases of lymphoma with SIMPONI®. Short follow-up periods, such as those of 1 year or less in the studies above, may not adequately reflect the true incidence of malignancies. Cases of acute and chronic leukemia have been reported with TNF-blocker use, including SIMPONI®. The risks and benefits of TNF-blocker therapy should be considered prior to initiating therapy in patients with a known malignancy or who develop a malignancy. Postmarketing cases of hepatosplenic T-cell lymphoma (HSTCL), a rare type of T-cell lymphoma, have been reported in patients treated with TNF blockers. These cases have had a very aggressive disease course and have been fatal. Nearly all reported cases have occurred in patients with Crohn’s disease or UC, and the majority were in adolescent and young adult males. Almost all of these patients had received treatment with azathioprine or 6-mercaptopurine concomitantly with a TNF blocker at or prior to diagnosis. A risk for the development for HSTCL in patients treated with TNF blockers cannot be excluded. Melanoma and Merkel cell carcinoma have been reported in patients treated with TNF-blocking agents, including SIMPONI®. Periodic skin examination is recommended for all patients, particularly those with risk factors for skin cancer. The use of TNF-blocking agents including SIMPONI® has been associated with reactivation of hepatitis B virus (HBV) in patients who are chronic hepatitis B carriers. In some instances, HBV reactivation occurring in conjunction with TNF-blocker therapy has been fatal. The majority of these reports have occurred in patients who received concomitant immunosuppressants. All patients should be tested for HBV infection before initiating TNF-blocker therapy. For patients who test positive for hepatitis B surface antigen, consult a physician with expertise in the treatment of hepatitis B before initiating TNF-blocker therapy. Exercise caution when prescribing SIMPONI® for patients identified as carriers of HBV and closely monitor for active HBV infection during and following termination of therapy with SIMPONI®. Discontinue SIMPONI® in patients who develop HBV reactivation, and initiate antiviral therapy with appropriate supportive treatment. Exercise caution when considering resumption of SIMPONI®, and monitor patients closely. Cases of worsening congestive heart failure (CHF) and new-onset CHF have been reported with TNF blockers, including SIMPONI®. Some cases had a fatal outcome. Exercise caution and monitor patients with heart failure. Discontinue SIMPONI® if new or worsening symptoms of heart failure appear. TNF-blocking agents, of which SIMPONI® is a member, have been associated with rare cases of new-onset or exacerbation of demyelinating disorders, including multiple sclerosis (MS) and Guillain-Barré syndrome. Cases of central demyelination, MS, optic neuritis, and peripheral demyelinating polyneuropathy have rarely been reported with SIMPONI®. Exercise caution in considering the use of SIMPONI® in patients with these disorders. Consider discontinuation if these disorders develop. Treatment with TNF blockers, including SIMPONI®, may result in the formation of antinuclear antibodies and, rarely, in the development of a lupus-like syndrome. Discontinue treatment if symptoms suggestive of a lupus-like syndrome develop. There have been reports of pancytopenia, leukopenia, neutropenia, agranulocytosis, aplastic anemia, and thrombocytopenia in patients receiving SIMPONI®. Exercise caution when using SIMPONI® in patients who have or had significant cytopenias. The concomitant use of a TNF blocker and abatacept or anakinra was associated with a higher risk of serious infections; therefore the use of SIMPONI® in combination with these products is not recommended. Care should be taken when switching from one biologic to another since overlapping biological activity may further increase the risk of infection. A higher rate of serious infections has also been observed in RA patients treated with rituximab who received subsequent treatment with a TNF blocker. The concomitant use of SIMPONI® with biologics approved to treat RA, PsA, or AS is not recommended because of the possibility of an increased risk of infection. People receiving SIMPONI® can receive vaccinations, except for live vaccines. Use of live vaccines could result in clinical infections, including disseminated infections. Administration of live vaccines to infants exposed to SIMPONI® in utero is not recommended for 6 months following the mother’s last SIMPONI® injection during pregnancy due to an increased risk of infection. It is recommended that therapeutic infectious agents not be given concurrently with SIMPONI® due to the possibility of clinical infections, including disseminated infections. Serious systemic hypersensitivity reactions (including anaphylactic reaction) have been reported with SIMPONI®, some occurring after the first dose. If an anaphylactic or other serious allergic reaction occurs, discontinue SIMPONI® immediately and institute appropriate therapy. Upper respiratory tract infection and nasopharyngitis were the most common adverse reactions reported in the combined Phase 3 trials through Week 16, occurring in 7% and 6% of patients treated with SIMPONI® as compared with 6% and 5% of patients in the control group, respectively. The rate of injection-site reactions was 6% with patients treated with SIMPONI® compared with 2% of patients in the control group. 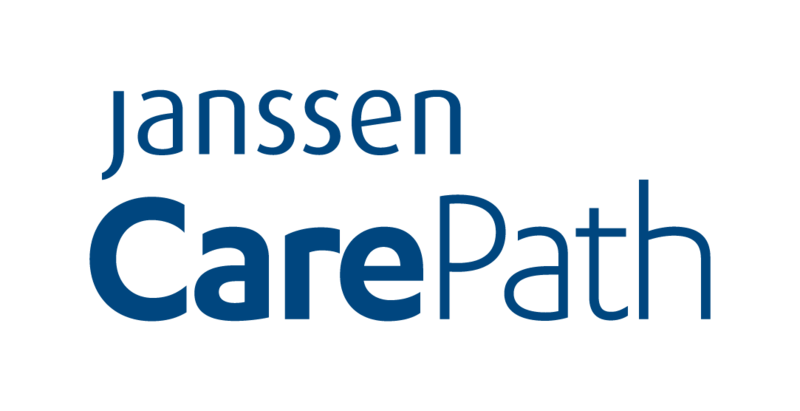 In the Phase 2/3 trials in UC evaluating SIMPONI®-treated patients, no new adverse drug reactions were identified, and the frequency of adverse drug reactions was similar to the safety profile observed in patients with RA, PsA, and AS. Please see the full Prescribing Information and Medication Guide for SIMPONI®. Provide the Medication Guide to your patients and encourage discussion. For RA, PsA, and AS: SIMPONI® is administered by 50-mg subcutaneous (SC) injection once a month. For UC: SIMPONI® induction dosage regimen is 200-mg SC injection at Week 0, followed by 100 mg at Week 2, and then 100 mg maintenance therapy every 4 weeks. This site is published by Janssen Biotech, Inc., which is solely responsible for its contents. This site is intended for use by healthcare professionals of the United States and its territories. Janssen Biotech, Inc., recognizes that the Internet is a global communications medium; however, laws, regulatory requirements, and medical practices for pharmaceutical products vary from country to country. The Prescribing Information included here may not be appropriate for use outside the United States and its territories.